Obtained by bleeding of a vat with red grapes, it is fermented at low temperature to keep the best aromas. It has a great deep apricot color. It is a nice floral and fruity wine. It accompanies well seafood, fishes, hors d’oeuvre and is much appreciated in summer. Has a deep apricot color with fine bubbles and a long-lasting foam. 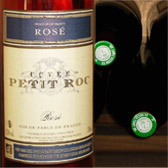 Its nose is reminiscent of violet and has very fruity aromas. Appreciated as an aperitif so as on desserts and tea-times with friends.